It's shocking just how much of it is original. It’s hard to imagine a young Carroll Shelby predicting that his cars would one day be worth a small fortune. He simply built the types of cars he wanted to drive himself. Turns out a lot of fellow enthusiasts shared his tastes, and the Shelby GT350 was just one of his results. Ever thought of owning one? Well, now you can because this nearly all-original 1965 Shelby GT350 will be hitting the auction block at Pebble Beach next month. According to its records, Shelby American completed the car on June 29, 1965, assigning it to an employee for company car use. It was soon sent on to Shelby’s Kansas City dealer as a demo, and then sold to its first owner. Over the years, it’s had seven owners but it still remains most original. In fact, 80 percent of its factory Wimbledon White paint is still intact. None of the sheetmetal is damaged and the original Shelby “confidential number” on the right front fender is still clearly visible. The engine, a 289-hp 4.7-liter V8, is also original with all numbered components matching. The transmission? You guessed it, original. Remarkably, the master cylinder, valve covers, intake manifold, carburetor, fan, and radiator haven’t been swapped out over the years. The only significant alteration are the seats, which were reupholstered several years ago. The rear package tray and oil pressure gauge are reproductions. Other than that, this Shelby GT350 is literally a time capsule back to 1965. As is common with original Shelbys, Carroll Shelby himself signed the glovebox along with Chuck Cantwell, the GT350 program project manager. 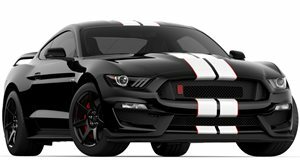 RM Auctions hasn’t given a price estimate, but based on previous GT350 sales, this one will likely fetch somewhere close to $500,000. Photos courtesy of RM Auctions.